By the Consolidated Slipper Corp. Size small. The leather is in excellent condition, clean and supple with good straps. Excellent Bennett type buckle and the chinstrap is equally good c/w metal end tip. Minor cracks in one of the rubber earpieces (see photogrphs). Lovely clean lining marked with a USAAF embroidered label and AAF ink stamp. Wired with a standard 'Y' loom, matched ANB-H-1 receivers by Utah and red PL-354 jackplug. Fitted with a 'flat' hook so ready to take an oxygen mask. 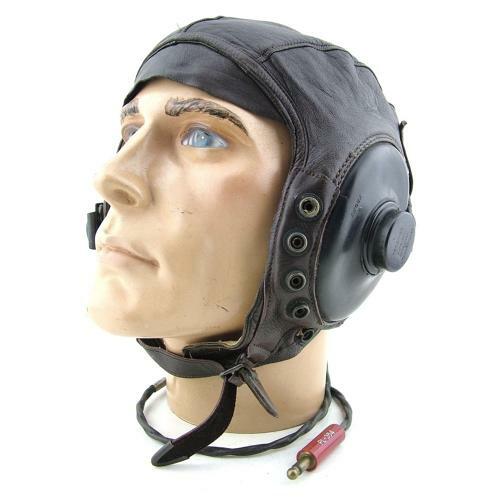 This is the later war variant with a buckled rear adjustment strap and leather reinforced oxygen mask press studs. An excellent lightly used example. Stock code H23307.